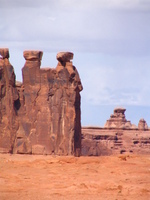 In Navajo culture, your identity is shaped by your clans. When meeting new people, you introduce yourself by your clan and trace it all the way down to your maternal grandmother’s. This means you will almost always find same-clan relatives anywhere you go. Out here, you will never be alone. When I moved to New Mexico, I left my clan. I left behind a rich network of women. My relationships with my mother, aunts and grandmother were intertwined with phone calls, shopping trips and breakfast at Einstein’s Bagels. Our clan was a warm support system that always offered too much food, too much advice and too much commentary on my hair. “Mrs. Smith,” a special education teacher, is my guardian angel. She was the first person willing to teach me how to read and write an IEP. She gave me my first pack of horse stickers for my students, she taught me about the rodeo, and she taught me about men (“Watch how they treat their mothers,” “Observe how they get mad” and “Don’t get married too fast”).With her two broken arms and tendency to forget things, she reminds me that heroes are hidden in everyday corners of life. And sometimes just down the hall. From the records clerk, I get bear hugs and was coached to tell people that I had allergies when my eyes were red from crying over my boyfriend after he moved abroad. From another assistant, I have learned to always keep family close, physically and spiritually. From the counselor, I have learned that pure kindness is never wasted, especially on children. From the teacher down the hall, I have learned about Navajo culture and acquired an assortment of “I Love Teaching” accessories. And then, there’s my assistant. She has been my surrogate mother for the past year and a half. From her, I have learned to teach. I may be the supervisor who signs her leave slips, but it’s I who sometimes sits back during class to watch how she disciplines a child. And observe how she teaches a boy with mental retardation how to use a calculator. From her, I have learned to slow down and use a ruler to make straight lines. She has taught me that it is worth it to trace stupid stenciled letters and to cut out intricate snowflake designs. She has taught me to be patient. To speak in low tones. And to always smile. She gives me mortifying lectures on dating and teaches me how to identify depression in teenagers. When I drive too fast and pass her car on the highway, she calls my cell phone to scold me. And when I get homesick and lonely, it’s she who tells me that she’ll be my relative. After all that expperience, why would you want to leave? I also teach Special Ed and it is so rewarding. I moved from a upper class MS to a HS that has a community within themselves, sort of what you are experiencing. Cultures are like a patchwork, rich in each of their own cultures/sub cultures. Take each day for what it is worth! Navaho - Hozhoogo hwil danahazaadoo, Blessed is the spot, Hozhoogo dahonighandoo, and the house, Hozhoogo adahwiisaadoo, and the place, Hozhoogo hajeidabiyidoo, and the heart, Hozhoogo dzil daniaadoo, and the mountain, Hozhoogo yisda dahwiiteehgoo, and the refuge, Hozhoogoo keyah dah naaznildoo, and the land. Dine e.
I have just spent the last hour going through your "musings" on teaching. I also teach Spec. Ed and have some Native American,(Odawa) students in my resource room. Their culture is much like the Navajo culture. I have learned through the years, I learn far more from them than they from me. Listen to the "old ones" they will teach you much. Never be afraid to abandon the lesson plan and go with whatever the moment presents. Those times are sometimes the most rewarding for both you and your students. Keep at it and on the evenings when you finally go home, feeling you can't possibly face another day, remember the next day is a new beginning and things will be better!! I wish you well in your career in special education. This is my 40th years in education, of which 39 has been in special education as teacher and Director of Special Education. I am retiring at the end of this year. Although I still get great pleasure out of my career, I feel the need to turn it over to new young teachers such as yourself. Would you be interested in having your students and my students exchange pen pal letters? I teach in Davenport Iowa at a middle school. Jessica, I "hear" in this post that you may be moving on and leaving this new clan behind. What you have found is community, something that is important to everyone. "Community" is what a teacher must create in a classroom in order for the students to feel safe to risk learning. You have found community in your school so you have felt safe learning how to teach. Lack of community in a classroom lets students feel isolated, lonely, and scared, and it is where many "misbehaviors" happen. When students feel part of their classroom community, they will do what is best and right to keep it healthy and strong. I knew when my classes had reached community when they began correcting each other's behavior, and sometimes mine, or when a new student would join us and they would "set him straight" and give him the guidelines or "rules" of this shared space and time. Wherever you go, establish a community for yourself because sometimes you need too much food, too much advice, and too much commentary on your hair. I could probably never really convey to you how much I look forward to reading your blog. My first teaching experience after college -- 30 years ago -- was also on a reservation. Like you, I left what was known to venture into the unknown. I grew up in a middle class WASPY neighborhood and had no idea as to what a reservation was. Imagine my surprise when I discovered that isolation was not being able to sit down to dinner with your family every evening, but rather living 45 miles from the nearest "town". However, I soon became a member of various Zuni families. The Zuni's were anxious to teach me about their culture and life on the reservation, and I was a blank canvas - anxious to learn. Many of those new relationships have been long-lasting. After 3 years on the res, I received a great offer to teach closer to home. It took several weeks of soul searching to decide what to do, but eventually, I decided to leave. Over the years, I have enjoyed passing along stories of my experiences to my college students that are now preparing to be teachers. Several of the students that I had on the reservation are now teachers themselves and we often times share stories with each other. There are still certain times of the year (such as after Thanksgiving for the Shalako celebration) that I long to be back in Zuni. It will always be a part of my heart and soul--a part I never want to forget. This entry speaks volumes about why you have been so successful in your classroom. The connections you have made at your school speak not just to the character of these women who support you, but to your own. I have admired the way you have approached your community. Your humility and understanding that you can learn something from everyone at your school has truly laid the foundation for the respect that they have for you and their willingness to support you and the new ideas you bring.